Enable a flexible contract design based on individual customer business needs? Keep your contract cost risk within an acceptable limit? Offer an easy and intuitive contract set up without operating errors? Be informed about contract usage details? If you answered ‘yes’ to any of questions above, SAP Hybris Cloud for Service provides is the solution for your business. A quantity contract is an agreement within service contracts processing. 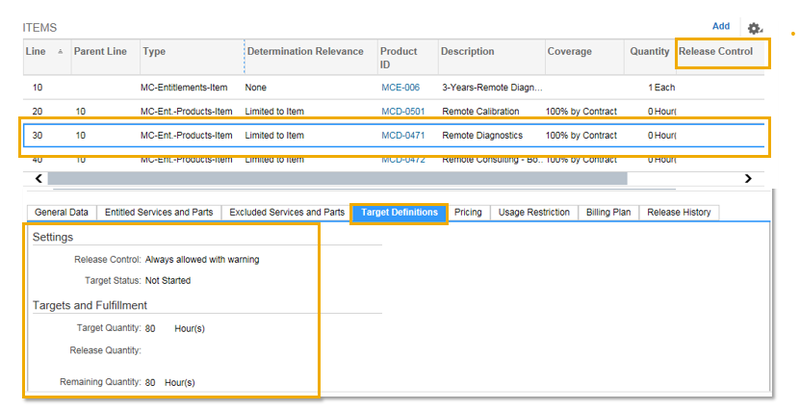 This business option allows you to administer contract determination for defined products which should be restricted in a period to a specific target quantity. By selecting this option, the customer can release products in the system from a work ticket and keep track of the contract targets and fulfillments that have been performed. In addition, you can establish a rule to allow `Release Control´, the release of products in contracts that either exceed the target quantity (without limits) or exceed the target quantity for the first time. As of release 1608, Quantity Contracts is a new feature in SAP Hybris Cloud for Customer. As of release 1608, it is possible to define products with a quantity limited call-off (release) in tickets. There is a contract with an entitlement ´3 year’s Remote support´ and its related products ´Remote Calibration´ and ´Remote Diagnostics’ are limited each with a ´Target Quantity of 80 Hours´. This means, for example, the `Remote Calibration´ can be determined within the given 3 year contract period in work tickets for a maximum of 80 hours. If a product needs to be defined/defaulted as ´limited´ in (quantity) contract determination, this can be configured by assigning a Contract item Type/Determination Rule in Business Configuration to the product. Exceed the defined target quantity one time only in the contract. Determine this contract for this product although its target quantity was exceeded. Definition: An entitlement is a contract item which represents a right or customer claim which requires an occurrence of a certain incident or condition. Example: Customer needs Maintenance for a defined product.Usually, customers have to pay a regular fee for this. Example: 3 year’s Maintenance Support, 1000, 00 USD/ per year.Often these entitlements are related to products and/or products categories listed in the tab ‘Entitled/Excluded Services & Parts’ for which the customer receives a discount (=coverage) if the products are entered in a work ticket with contract determination. Definition: It describes a product or service the customer receives in case of contract determination discount. Example: Filter X was entered as work ticket item due to needed maintenance, contract-related discount (=coverage): 50%.Moreover, if this entitled product should be limited (~ used for Quantity Contract purposes) you can also set a target quantity. Example: max. 500 filters (in total) can be consumed between 01-01.2016 – 12-31-2016 which is equal to the contract duration. Definition: It describes content for information or structuring purposes. The Determination Relevance Rules are directly associated to the contract item types and influence which product(s) of a contract item are relevant for contract determination in work ticket items. Limited to Entitled Services and Parts: This contract item will be determined if at least one of the products/product categories in the tab ‘Entitled/Excluded Services & Parts’ is used in the work ticket item. Example: You have entered the Entitlement– Contract Item ´3 year’s Maintenance Support´ in tab Entitled/Excluded Services & Parts’, the Screw X and Repair Service Y will be assigned to this. If you enter Service Y in the ticket, the item determined will be ´3 year’s Maintenance Support´. Limited to item: This contract item will be determined only if this line item product is used in the ticket item. Example: You have entered ´Filter Z´ as Entitled Product – Contract item with a 50 each quantity limit. Only if you enter ‘Filter Z’ in the ticket this item will be determined and, only as long as you have not exceeded with your call-offs the set the target quantity. Items and Entitled Services and Parts: This contract item will be determined if the line item product or one of its assigned products/product categories in the tab ‘Entitled/Excluded Services & Parts’ is used. Example: You have entered Entitled Product – Contract Item ´Gasket X´ with a 100 each quantity limit and in tab ‘Entitled Services and Parts’ [the identical in construction] Gaskets X* and X** were assigned to this. No matter if you enter Gasket X*, Gasket X** or Gasket X in the ticket, the item determined will be an Entitled Product – contract item ´Gasket X´.Note: If you have reached the target quantity for Gasket X , the Entitled Product – Contract Item ´Gasket X´ won´t be determined, but the item would be further determined if you enter Gasket X* or Gasket** in the ticket since there is no limit. None: This contract line item should never be determined in the ticket item. Example: Text – Contract Items such as ´Consolidation done May 15th 2016´or ´Special Maintenance Package based on Promotion July 2016´ or even an Entitlement– Contract Item without tab ‘Entitled Services & Parts’ (see screenshot 1). So go ahead and try out the different scenarios that are possible with this new feature! Very Nice blog and useful information on Contracts, It would be helpful if you can share differences between using Service Contracts and Quantity contracts? Also please share detail contracts process documents if any or provide me link?